A simple and good for you breakfast pudding that can be made in the morning or the previous night. 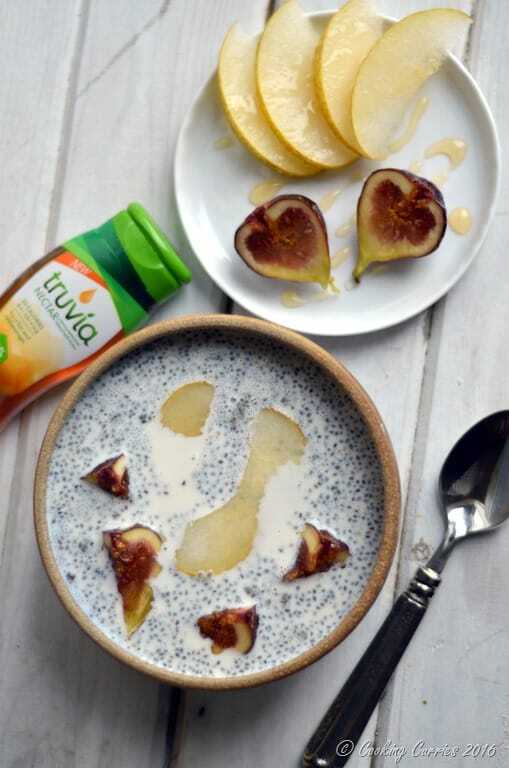 Either way, it is made tastier without all that calories with the help of Truvia Nectar. I have a massive sweet tooth. I am seriously addicted to sugar and its always been like that. There have been stretches when I eat a huge portion of dessert every single day, after dinner. It is with a lot of effort that I sometimes try to stay away from sweet things. Ok, seriously, getting back to the pudding and sugar addiction now. I know of people who love their morning oatmeal savory or have their coffee without sugar. I cant do either of that. I love that sugar in my coffee and I love oatmeal with a lot of sugar too. Plain with just milk, but lots of sugar. That is when I discovered Truvia Nectar. It is made with natural stevia extract and honey and has 50% less calories. I usually don’t go for the low calorie or low sugar version, because you can tell. You can taste it and you know its not real. This tastes just like honey and you wont even know it if no one told you. 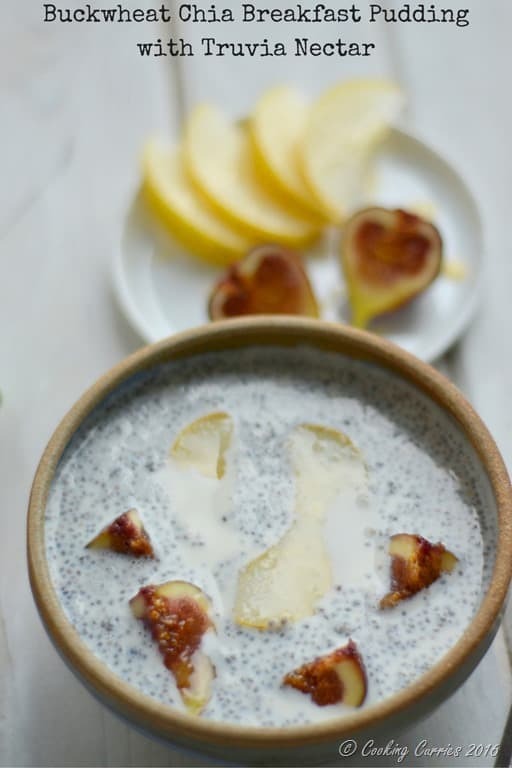 This buckwheat breakfast pudding is my new favorite these days and I make it with some cream of buckwheat, chia and top it with some favorite fruits – berries or pear and figs, just like in this one and drizzle with some Truvia Nectar. You are off to a great start to the day and you are gonna love it. And you know what, I have the 3 oz flip top bottle of Truvia Nectar and I bought it along with me on my vacation!! How cool is that?! It is small enough that you can easily fit it in your luggage and take it along with you, so you can keep on eating good, whether you are home or elsewhere. 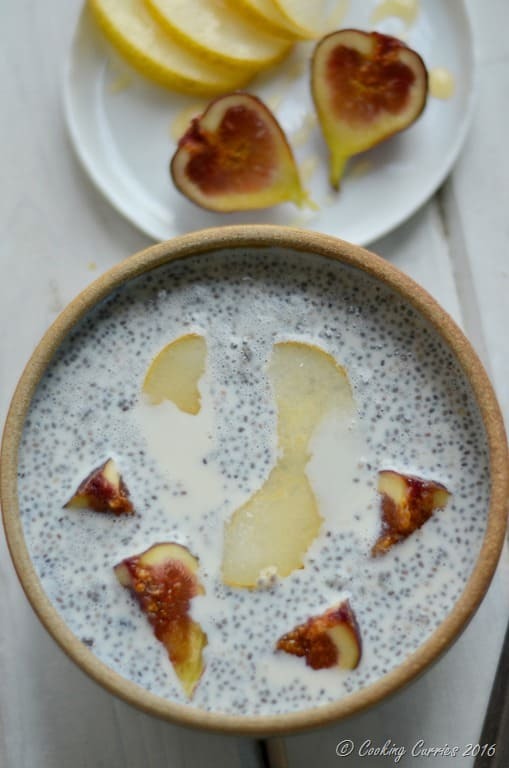 Soak the chia seeds in the 1/2 cup of milk, overnight or at least for 20 mins. Mix the cream of buckwheat and 1 cup milk in a microwave safe bowl and microwave for about 2 minutes. Add the vanilla extract to this and the soaked chia seeds to this as well. 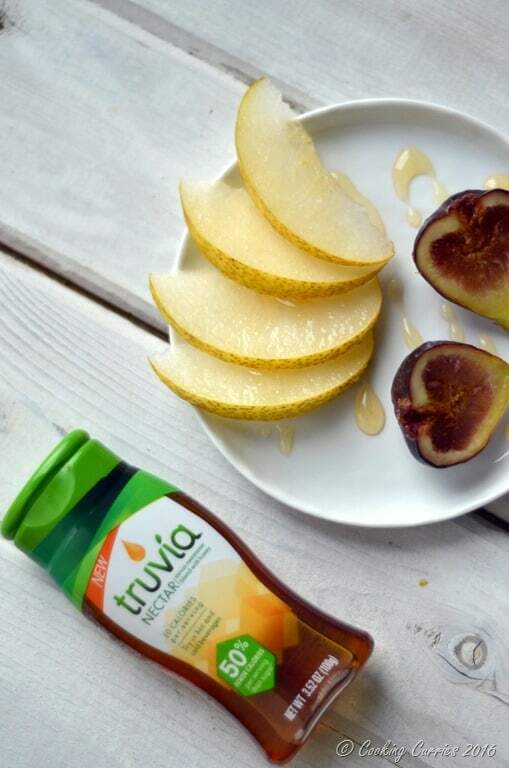 Before serving, top with slices of fruit and drizzle with Truvia Nectar.